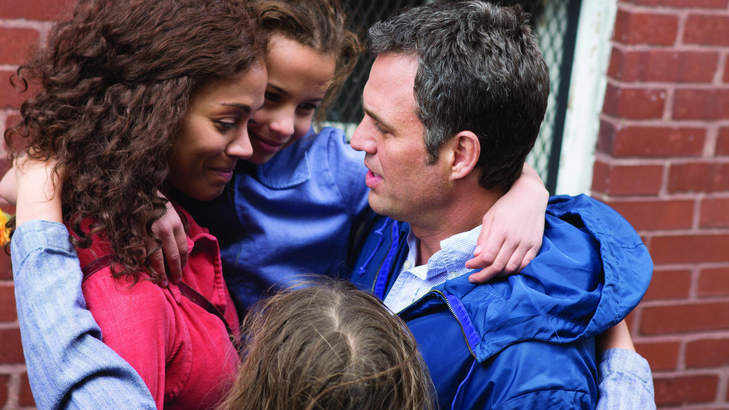 The directorial debut from writer Maya Forbes, Infinitely Polar Bear is a heartwarming off-the-wall comedy focusing on the rollercoaster of family life. Set in downtown Boston during the ‘70s, the film centres on a small working class family, with father Cameron (Mark Ruffalo) at its head. Cam has bi-polar disorder, leading him to struggle with the multiple responsibilities in his life. At the start of the film he’s seperated from his wife Maggie, and is then left in charge of their two daughters, Amelia and Faith, while their mother studies abroad. Cam is not your typical father figure. Never seen without a cigarette in his mouth and at least four days stubble, he’s frequently being scolded by his daughters for being weird and scaring people away. Cam is a joker, and each one of the stories he tells his kids is more fantastic than the last, but we can see that underneath the surface there is a lot of pain inside of him. Throughout the film you can feel a deep sense of loneliness emnating from Cam as a character. He’s failed almost everything he’s ever tried to do, and has nothing to show for it but a beat up car and a broken family. Ruffalo really shines in this role, giving a soft touch to the manic and erratic character, allowing us to see his deeper side as well as laugh along with his hijinks. Cam’s wife Maggie (Zoe Saldana) is only seen sporadically in the film, adding tension when she arrives to visit monthly from New York. You may or may not recognise her as the blue feline love interest from Avatar. Trading in sci-fi for lo-fi she does a great job of bringing through the emotions of a struggling single mother. Executive producer of Infinitely Polar Bear J.J. Abrams also has ties with Saldana as they worked together on the Star Trek films, and it’s nice to see the change of pace here in the production. The ‘70s feel of the set design and costumes brings a warm sense of nostalgia to the film, and Ruffalo’s wacky wardrobe changes never fail to amuse. Infinitely Polar Bear starts to grow on you as soon as you start watching it. You slowly get to know the characters, until you find yourself silently hoping they all end up happily ever after. The film celebrates the personalities of its characters, and getting to see into and share their lives becomes our focus. Through their highs and lows, we begin to grow with them as their relationships change and strengthen. Director Forbes has labelled the film as autobiographical, and even decided to cast her own daughter (Imogen Wolodarsky) for the role of the older daughter Amelia. In this sense, Infinitely Polar Bear feels a lot like a box of old photographs that the director is looking through, rather than moving in any solid direction. Throughout the movie we see Cameron filming his family on an old video camera, and we are sometimes shown snippets of his vintage home movie footage as it plays on screen. Infinitely Polar Bear doesn’t quite move in any one direction, and seems to function more as a loose collection of scenes. Elsewhere we can see somewhat disappointing performances by the young actresses, at times leaving dialogue feeling forced or slightly out of place. The beauty of Infinitely Polar Bear is in the setting it creates through its characters. Strong performances by the lead Mark Ruffalo cements the mood sparked by the gorgeous production and vintage cinematography. Infinitely Polar Bear captures a snapshot of a fathers love for his daughters, and his struggle to fight against the conflicts inside and around himself. It may suffer slightly from a lack of direction, but like it’s protagonist Cam, it more than makes up for it with heart.